In Mesopotamia there is a shift in the conception of justice from the grand cosmic vision to a conception of justice embodied in law. This set the tone for later representation of justice in the Middle and Near East and in the Western world thereafter. While the Mesopotamian conception of justice was still considered divine business and, to some extent, cosmic, it was much less so than earlier conceptions. The Mesopotamian conception of justice was limited, for the most part, to protection of the widows, orphans, the dispossessed and the weak. While in Zarathustra’s, Egyptian and Rig Vedic systems, all humans including the rulers were subject to the divine-cosmic rules of justice, in Mesopotamia the law was given by the deities to the kings who were responsible for their implementation as representatives of the gods on earth. Doak, Brian R. 2006. 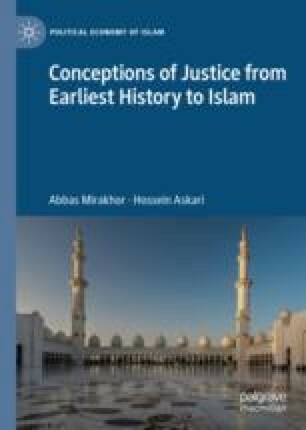 The Origins of Social Justice in the Ancient Mesopotamian Religious Traditions. Faculty Publications-College of Christian Studies, Paper 185. http://digitalcommunications.georgefox.edu/ccs/185. Ur, Jason. 2014. Household and the Emergence of Cities in Ancient Mesopotamia. Cambridge Archaeological Journal 26 (2). http://scholar.harvard.edu/jasonur.